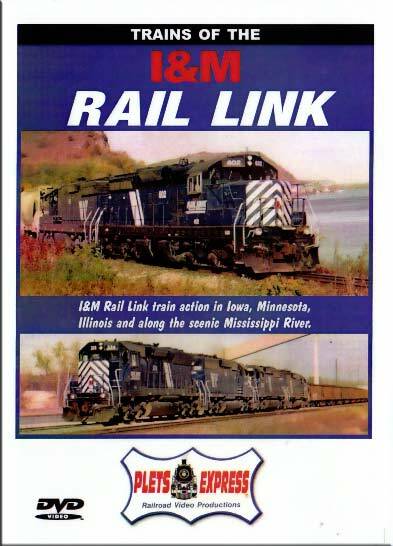 The I&M Rail Link is a large Midwest regional railroad and their trains are seen traveling across Iowa, Minnesota and Illinois. Starting at Marquette, Iowa you'll see trains going north to the Twin Cities, south to Davenport, east to Chicago and west to Mason City. This exciting video also features fall colors and scenic river running along the majestic bluffs of the Mississippi River. I&M Rail Link action includes road freights, intermodals and unit grain trains with end unit pushers. Plus yard switching and locals that are powered by vintage ex Soo Line High Hood GP9's. Connecting railroads of the UP, BNSF, EJ&E, CP and Amtrak are also briefly seen. Shot from the camera of Bradley A. Plets. Footage era 2000-2001.